The history of Steyr dates back to 1820 and the manufacturing of sporting and military rifles. Hence, the concentric circle of the Steyr badge represents a target. The terms of the Versailles Treaty after WWII took away all Steyr’s business except for bicycles. They soon decided to enter the car business. Their first car went into production in 1920, and their last car was produced until 1977. Their history includes associations with Daimler, Porsche, and FIAT, among others. The Haflinger is a light 4x4 all-terrain vehicle. 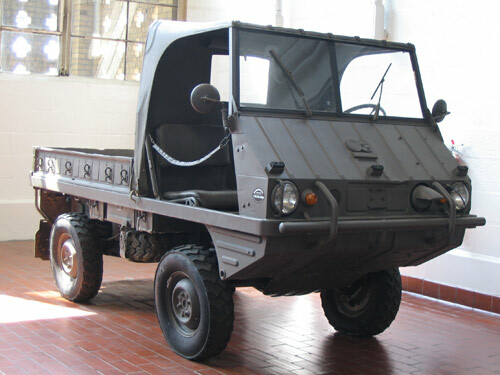 Though cars are no longer made, Steyr is very active in the commercial vehicle field and is today best known for commercial and military vehicles. Steyr is a contract builder of the G series of 4x4 vehicles for Mercedes-Benz. The Haflinger gets its name from a breed of robust mountain pony of Austria.